Frogs and toads are affected by the impacts of climate change. For far too long, climate change seemed like a distant, impersonal problem. But the unfortunate reality is that many wildlife populations are feeling the effects of climate change now, and right in our own backyards. Meet Stephanie, Paul and Jack: three people who love the wildlife in their area and are actively lobbying Congress to protect it. Stephanie Sides’ home in Encinitas, Calif. used to be a hot spot for the local bullfrogs to hang out. “I used to have an entire symphony of voices, all distinctive with different pitches. Even though I used to have to wear earplugs to get to sleep at night, I loved those frogs and their music.” She even hosted a “bullfrog party” several summers in a row. But now, she says, “The bullfrogs have largely disappeared in the last several years, presumably due to drought.” California experienced drought conditions from 2011 until just this year, and frogs and toads need water to mate and lay their eggs. “I hear one lone frog voice this summer,” she says. The days of her bullfrog parties, of connecting with each other over the joys and intrigue of nature, are “now mostly lost and sorely missed,” she says. While the lack of snow is disappointing for him, it’s life-threatening to the area’s fish. “The lack of water has impacted the fishery,” Paul explains. 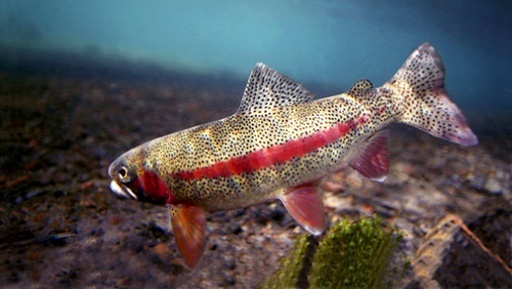 “Trout need clean and cold water,” but the reduced snowmelt is making the trout’s habitat less and less viable. And those birds Paul enjoyed watching while he fished? He might not see them in his area for much longer. According to a report from the Audubon Society, 314 bird species will see their ranges shift and shrink over the next decades. American pika. Photo by NPS. As a kid, Jack Greene used to go on nature walks and play in the woods with his mother and sister. As he got older, he started hunting and fishing with his father and uncles. “In my late 20s I was introduced to nature study and nature centers, which transformed me into a student of the marvels of nature,” Jack says. Today, the student has become the teacher. Jack leads field trips in the Rocky Mountains and Pacific Northwest for students of all ages, and he trains environmental science teachers across the country. He also helps collect lots of “citizen science” data on the wildlife he sees. “I am presently involved in documenting the changes in pika populations in northern Yellowstone,” Jack says, which he does through a Colorado State University Program called the Rocky Mountain Sustainability and Science Network. The pika, a tiny mammalian cousin of the rabbit, has already disappeared from over one-third of its previously known habitat. Why? They aren’t adapted to heat above 78 degrees Fahrenheit, and as global temperatures rise, their only option is to move to higher elevations. If there are no higher elevations around and temperatures are still too high, they can’t survive. Stephanie, Paul and Jack all know that the biggest threat to these species is unmitigated climate change. Higher temperatures and less predictable precipitation puts stress on many different wildlife populations, so the best chance of protecting them all is to reduce our greenhouse gas emissions and stabilize our climate. Members of the Citizens Climate Lobby on the Capital steps. Photo CCL. To that end, Stephanie, Paul, and Jack are all members of Citizens’ Climate Lobby (CCL). CCL is a nonprofit, nonpartisan group where thousands of volunteers lobby Congress for climate legislation. Specifically, CCL volunteers advocate for a carbon fee and dividend, which would put a price on climate-changing carbon emissions and return that revenue to American households. By making it more expensive for fossil fuel companies and others to dump greenhouse gases into the atmosphere, they—and our whole economy—will quickly shift toward cheaper low- or no-carbon energy options. That, in turn, will help stabilize our climate. Whether they’re a Republican or a Democrat, you can almost always find common ground and mutual love of some element of the outdoors. And when your representative hears how climate change is hurting wildlife in your district, in your town, or right in your backyard, it can move them to act. Flannery Winchester is deputy communications director for the Citizens’ Climate Lobby (CCL) and comes from a long line of farmers and others who care for the land. CCL is a non-profit, non-partisan, grassroots advocacy organization focused on national policies to address climate change.